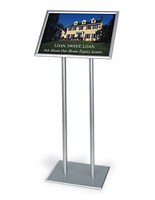 Advertise your specials and promotions inside with an aluminum floor standing sign. 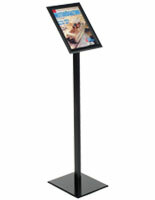 This floor standing sign has an angled holder which displays your signs for easy viewing. 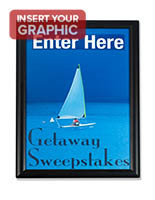 The snap frame holds your sign under a clear plastic lens which will help protect it from dust and fading. 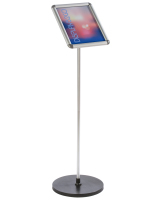 A floor standing sign is easy to use. First lift up each edge of the frame, then place your poster under the plastic. Snap close the frame sides and you're done. 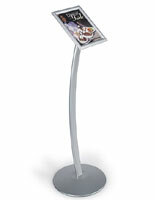 This floor standing sign is 8.5" X 11" which is great for displaying your posters. 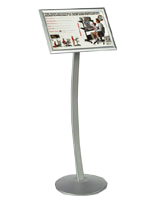 Such sign holders as a floor standing display have mitred corners and the frames are supported by a single leg. All sign holders ship disassembled in one box to save on shipping. 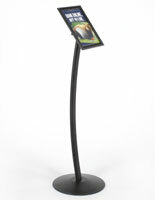 The floor standing sign, also known as an angled sign holder includes all hardware needed to assemble it, except a screwdriver. 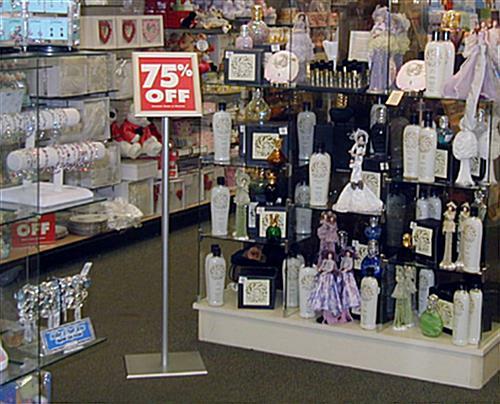 Assemble this display in less than 10 minutes. 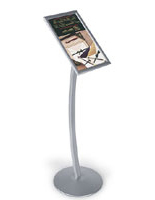 The floor standing display, also known as a metal sign holder, can display an 8.5" x 11" poster.